The center of the 2009 plaque features a polar bear supporting the earth on his back, representing the newly founded Environmental Stewardship program and the establishment of the Environmental Values Statement for the School. The upper left corner shows a Democratic donkey bearing President Obama’s initials, which represents his 2008 Presidential Election win. The upper right depicts the Lion Capital of Ashoka representing the School’s India Week program. Spanning the bottom is an arrow which represents the cross country team’s win at New England’s. The lower section of the 2007 plaque depicts Hargate with an “Open” banner on its roof, representing the reopening of the building after extensive repairs due to the Mother’s Day Flood of 2006. 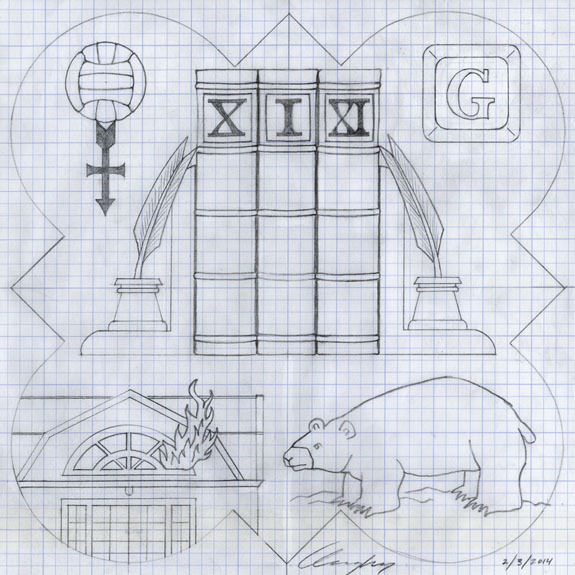 Above Hargate, on the far left and right, the initials “X” and “C” to commemorate the success of the girls and boys cross country teams. The upper center depicts the Earth surrounded by a recycling symbol, marks the beginning of the Environmental Stewardship program at SPS. The upper left features the Henley shield, representing the girls and boys crew teams at the Henley Royal Regatta. The upper right corner shows the first iPhone, which was released that year with great fanfare. I will be posting photos of the carving process here on the Form Plaque Project blog and on the Form Plaque Project Facebook page when I begin working on the carving process of the 2007 plaque. 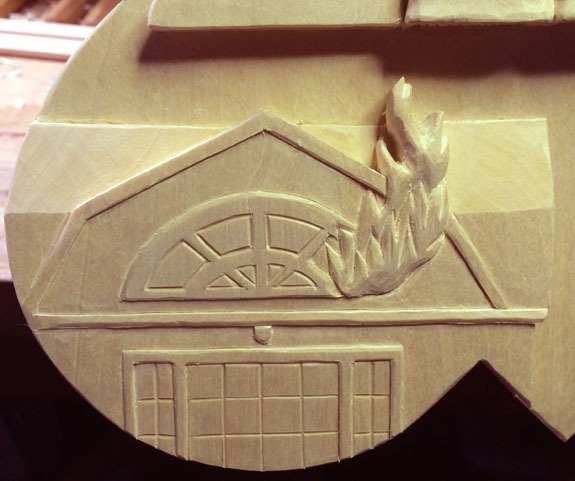 I will be posting photos of the carving process here on the Form Plaque Project blog and on the Form Plaque Project Facebook page when I begin working on the carving process of the 2009 plaque. Below is a photograph of the completed plaque for the Form of 1999. The plaque is being dedicated on May 31, 2014 and hangs in the Middle Dining Hall of Coit (The Upper) above the panels that contain the names of all the members of the Form of 1999. 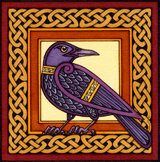 Below the photo is the description of the elements incorporated in the plaque design. 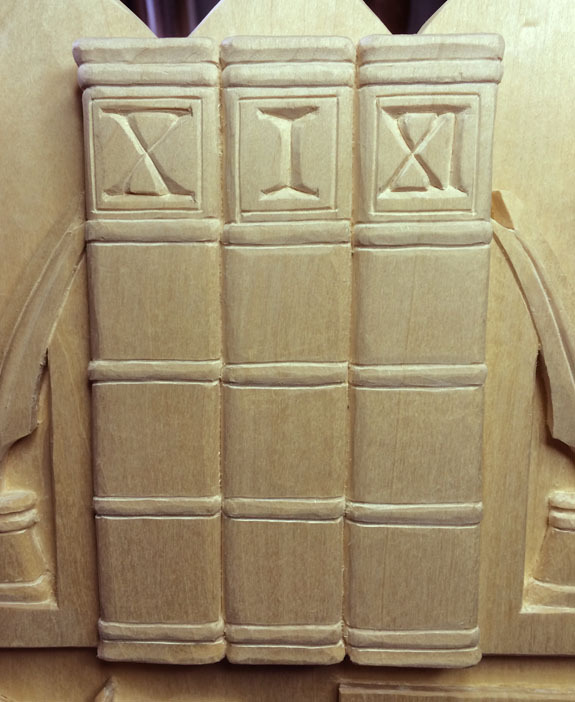 The central element of the Form of 1999 plaque represents the changes in St. Paul’s School leadership during the form’s four years, with a book for each of the leaders. Labels on the spines identify them: “X” for the Tenth Rector David Verne Hicks, “I” for Interim Rector Clifford J. Gillespie, and “XI” for Eleventh Rector Craig B. Anderson. The bookends with their inkwells and quills commemorate the beginning of the Schlesinger Writer-in-Residence program. The upper left corner features a volleyball/arrow/women’s symbol, representing the New England division title wins for the girls’ volleyball and cross country teams. The “G” on the computer key in the upper right refers to the incorporation of Google in 1998. The bottom left corner represents the fire in the Drury dorm in March 1999. At the lower right, a rainbow flag with the letters “GSA” marks the founding of the Gay Straight Alliance, inspired by the Chapel speech of Dustin Brauneck ’99. The Form of 1999 plaque is now completed. 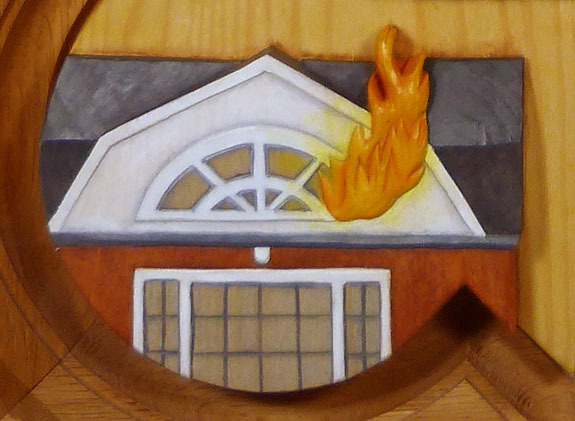 The above photograph shows a sample of the painted finish on the plaque – representing the fire in the Drury dorm in March of 1999. The completed framed plaque will be revealed on Anniversary Weekend on Saturday May 31st – at which time photographs of the finished plaque will be published online. Thank you to the representative from the Form of 1999 for your help with this project – I am looking forward to seeing members of the Form of 1999 at the SPS Anniversary event to celebrate your new Form plaque! 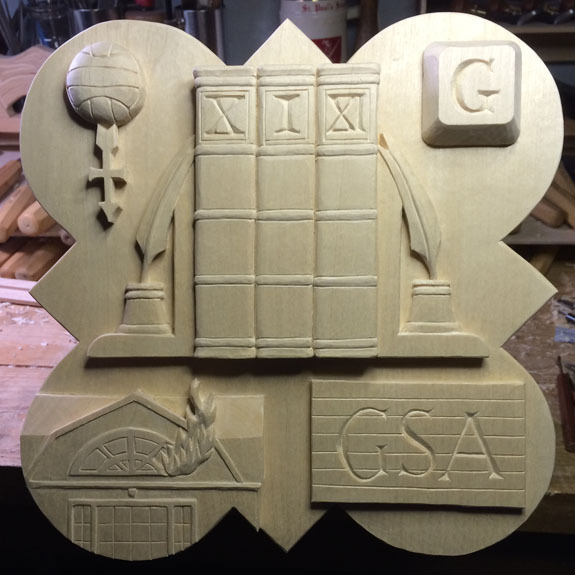 The carving for the 1999 Form plaque is completed. 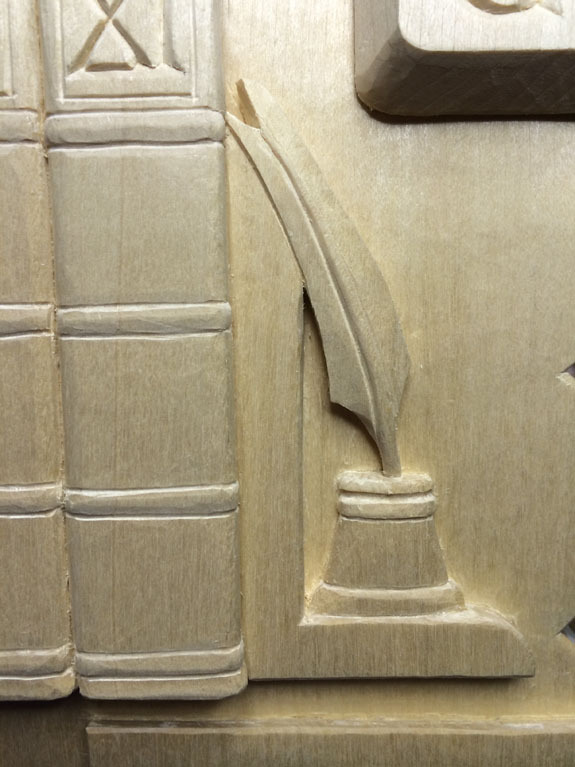 The photos below are of the finished carving, with descriptions of the symbols used in the design. 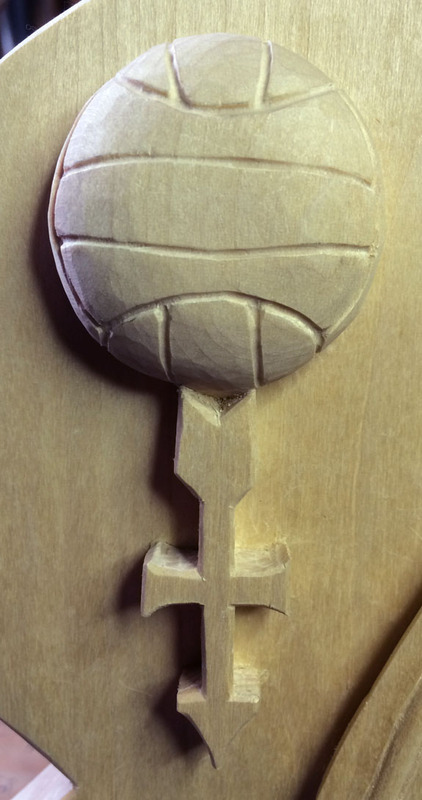 The upper left corner features a volleyball and arrow combined into a women’s symbol – representing the New England division title wins for both the girls’ volleyball and girls’ cross country. The upper right corner features the letter “G” on a computer keyboard key – representing the launch of the Google search engine on 9/4/1998. The bookends supporting the books feature inkwells with quills – commemorating the beginning of the Schlesinger Writer-in-Residence program at SPS. The bottom left corner represents the fire that occurred in the Drury dorm. 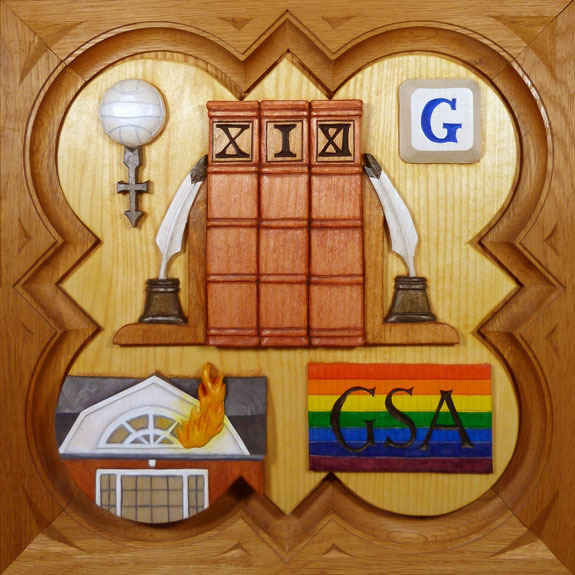 The bottom right corner features a rainbow flag with the letters “GSA” celebrating the founding of the Gay Straight Alliance. 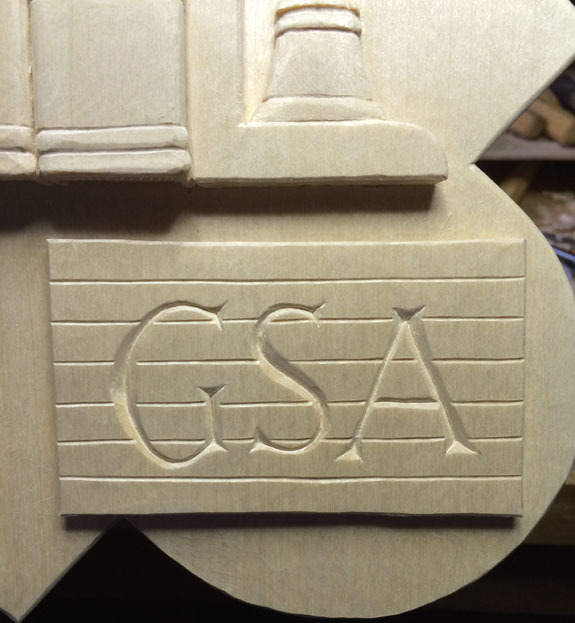 Now that the carving stage is completed the plaque will be oiled and painted before being put on display for Anniversary/Graduation weekend at the end of May. 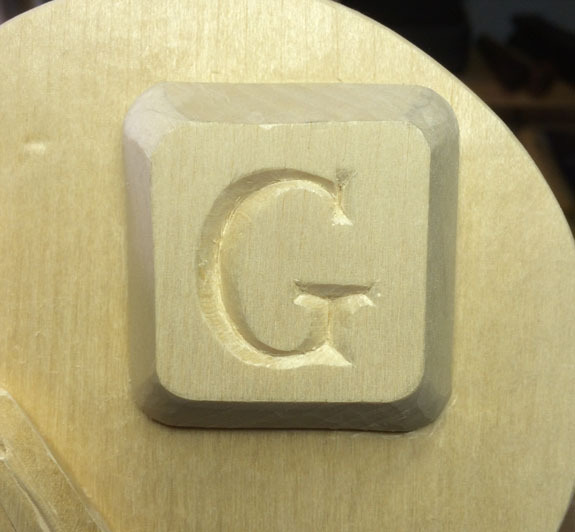 I will now begin working on the carving process, with the plan to have the finished plaque to present at Anniversary weekend in June this year. Photos of the process will be posted on the blog, so stay tuned for more information!